Since she was a baby, Aza has suffered from a mysterious lung disease that makes it ever harder for her to breathe, to speak, to live. So when Aza catches a glimpse of a ship in the sky, her family chalks it up to a cruel side effect of her medication. But Aza doesn't think this is a hallucination. She can her someone on the ship calling her name. Only her best friend, Jason, listens. Jason, who's always been there. Jason, for whom she might have more-than-friendly feelings. But before Aza can consider that thrilling idea, something goes terribly wrong. Aza is lost to our world - and found, by another. Magonia. Above the clouds, in a land of trading ships, Aza is not the weak and dying thing she was. In Magnolia, she can breathe for the first time. Better, she has immense power - and as she navigates her new life, she discovers that war is coming. Magonia and Earth are on the cusp of a reckoning. And in Aza's hands lies the fate of the whole of humanity - including the boy who loves her. Where do her loyalties lie? This one stressed me out. It was so very close to a will-not-finish, but I'm a stubborn girl, and I was determined to see it through to the end. My dislike had nothing to do with the writing. It was decently put together. It was the story. I just couldn't get into the story or care for any of the characters. Mostly because I had NO idea what was going on or why it mattered. And there were airships in it! And pirates! I love airships and pirates! I tried to imagine them as pirate ships with hand quilted sails, for some reason, floating through the clouds, but even that didn't help. Quick summary - When we meet Aza, she's dying, and she's doing it with flare, as only Aza can apparently do things. She's quick to joke, to illicit reactions through sarcastic wit, and to spin a tale using her illness as a crutch. But it's a bit of a cry-wolf situation. One day in class, looking out the window, she sees a ship in the sky and a voice is calling her name. 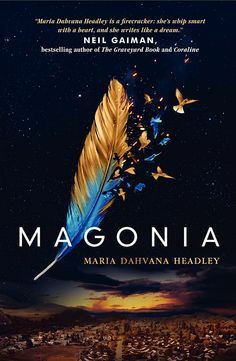 Before she's ready, the illness has taken her life in a bizarre, bird-frenzy occurrence, and she wakes up on a ship, surrounded by people who claim she is kind of like a changeling...not human, but in fact from Magonia and the daughter of a Captain with the ability to use a bird living in her chest to sing and control the elements. And then I was lost. She wants to make it home. She can't. But this bird thing. Not sure about this bird thing. As I was reading, I felt myself constantly questioning who Aza really was. I felt like I got a picture of her (and it wasn't necessarily a pretty picture), but never really met the real thing. The same with her best friend, Jason, who strangely never really believed she was gone. Aza is rough around the edges, and while not angsty, was very irritating. She was almost too abrasive. The idea of Magonia is very unique and original, but the execution was a bit all over the place. I can only imagine how difficult it is to world build something living solely in your head and not in legend somewhere to pull ideas and details from. The cover designers knocked it out of the park though. Beautiful.